Here's a new and improved photo from when we had a potluck "Break-the-Fast"
So I know I've said in past blog entires that I'm not the biggest chocolate cake fan, so it's a pretty big deal for me to say that I loved this chocolate cake. Y'all, seriously. This cake is the moistest, most deliciously chocolate cake. It is AWESOME! 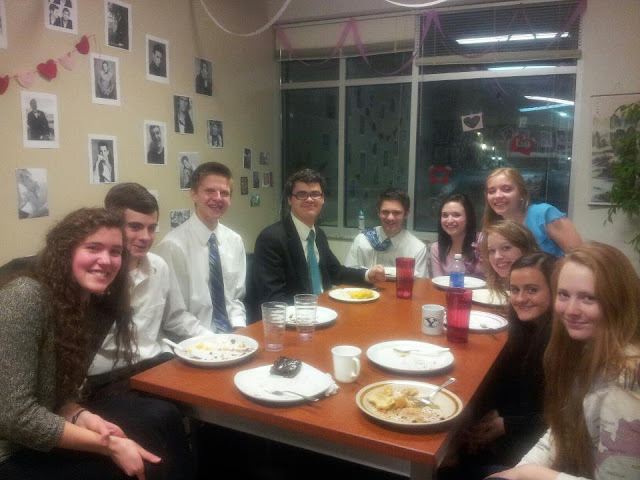 My "family" group at BYU has dinner pretty much every Sunday night. It's always so fun to cook together and spend time with our group. Look how beautifully awkward we look! 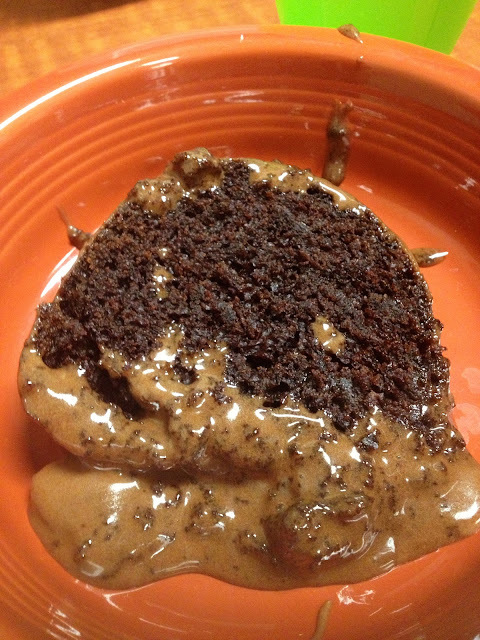 So anyway, I made this delicious cake and I am so excited to share this recipe with you! Recipe adapted from Neighbor Food Blog. 1. Preheat oven to 350 degrees fahrenheit. Generously butter and flour a bundt pan, making sure to coat every crevice. Tap the excess flour out and discard. 2. Whisk the water and cocoa powder in a small saucepan over medium heat. Bring it to a boil and let it boil for about 30 seconds. Stir continually. Remove from heat and let it cool for about five minutes. 3. Measure out the milk and add in the vinegar. Let it sit for five minutes. 4. Beat sugar, salt, baking soda, eggs, and egg yolk until really well-incorporated. Add the milk mixture, along with oil and vanilla and beat on medium speed for 1 minute. Add the flour and mix until it's thoroughly incorporated. Next, add the cocoa powder/water mixture and beat until there are no more lumps (about 2 minutes). 5. Pour into the prepared pan and bake for 1 hour or until a toothpick comes out clean. 6. Let the cake cool completely before adding the frosting. Melt the chocolate chips. Melt the butter separately and then beat the butter with the melted chocolate. Add half the powdered sugar and whisk until smooth. Add the sour cream and the other half of the powdered sugar and beat. Add the sour cream and the water and beat until it's smooth. Pour over cooled cake and enjoy! I didn't wait for mine to cool, so my frosting was all melty, but that didn't stop anyone from eating it. The way I frosted it caused the center hole to be filled to the top with frosting, so when I cut into it, it made a huge mess... but we cleaned that up really fast with spoons.